I had a Japanese cookery lesson with Kamikaze Kitchen a few weeks ago and it’s given me an urge to get back in the kitchen. The class was amazing with tips on miso, sushi and gyoza dumplings. Now I now more about how to make miso I’ve become really enthusiastic and have been trying different combinations of ingredients. 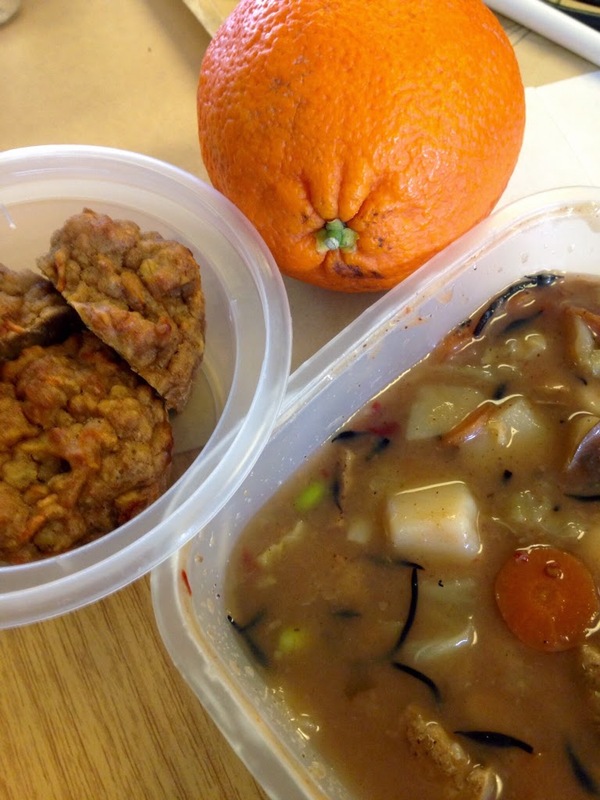 This included garlic, ginger, kombu, kelp powder, kijiki, carrots, potatoes, tofu, edamame and miso. It turned out rich and thick and flavourful. I followed up with an orange and a couple of home made muffins. Much like the soup the muffins were full of different ingredients. They included Apple purée, oats, brown sugar, and grated carrot. While I ate I read The Princess Bride. I’ve started watching Game of Thrones and its reminded me how much I enjoy fantasy and adventures tales. I can’t believe The Princess Bride had slipped through my hands before but as with so many things better late than never. On Saturday I headed to the London Vegan Beer festival where I drank various fine vegan beverages, listened to bands, took part in karaoke, and partook of some vegan BBQ. 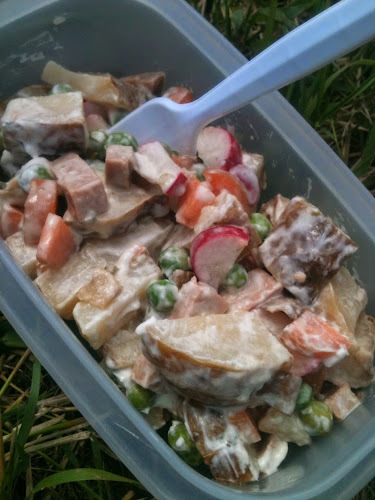 One of the dishes on offer at the BBQ was a potato salad. Alas it was so tasty I ate the lot before thinking that I should have snapped a photo. However let me describe it as the house special fried rice approach to potato salad, only not fried and minus the kind of animal related items. The potatoes had been mixed with peas, corn, gerkins, and mayonnaise. Possibly a few other items crept in to this king of potato. I attended a family BBQ on Sunday. As is the case with my family it was over catered. So it would have been rude not to bring home with me some leftover jacket potatoes and create my own multi ingredient potato salad. Into the mix went: chopped jacket potatoes, radishes, carrot, cooked peas, Fry’s Polony, Plamil garlic mayo, and gherkin burger relish. I’ve been trying to find a title of his that lives up to The Anubis Gate. This isn’t it, but it’s still pretty good. A good tale with plenty of swashbuckling, and a bearable amount of magic to add spice. I found the descriptions of sea battles hard going but it was satisfying watching our hero develop, and seeing plot elements come together.